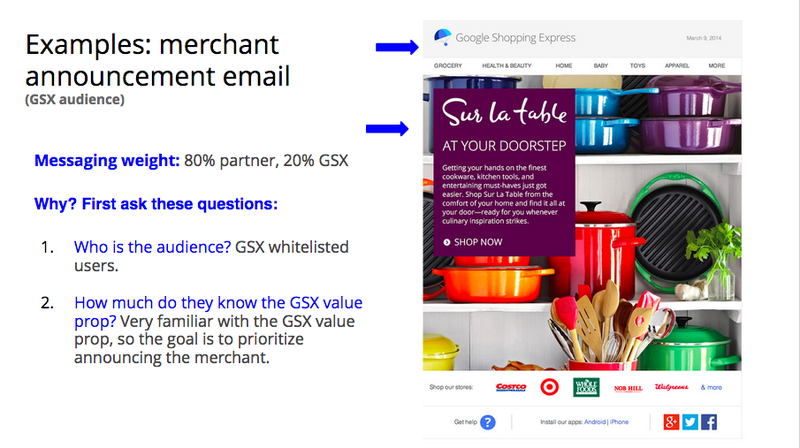 Google's high-profile entry into the same-day delivery fray brought many challenges and opportunities for content strategy. I led the charge defining a tone and voice for product and communication, determining share of voice best practices between Shopping Express and the merchant partners (Whole Foods, Target, Guitar Center), and untangling delicate content problems that come with introducing new features on such a stage under scrutiny. With X many users in X many cities, Shopping Express delivers what you need. I managed and drove a team to deliver great content. Every initiative, from feature update to internal processes, was based in core strategy that kept the train on track. Balancing our own voice + that of the merchants was a delicate, but interesting balance.